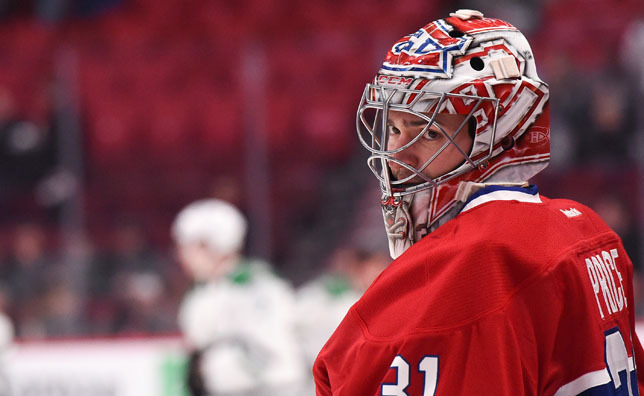 NEW YORK – Minnesota Wild goaltender Devan Dubnyk, Montreal Canadiens goaltender Carey Price and Washington Capitals left wing Alex Ovechkin have been named the NHL’s “Three Stars” for the month of February. Dubnyk (11-2-1, 1.64 GAA, .939 SV%, 3 SO) led the NHL with 11 wins and three shutouts while starting all 14 games for the Wild (33-22-7, 73 points), who climbed from 12th place into the final playoff spot in the Western Conference. He allowed two or fewer goals in 11 of his 14 appearances, including shutout victories over the Chicago Blackhawks Feb. 3 (24 SV), Colorado Avalanche Feb. 7 (18 SV) and Edmonton Oilers Feb. 20 (15 SV). Overall, Dubnyk is 24-8-3 (2.15 GAA, .926 SV%, 6 SO) in 39 appearances this season, establishing career highs in wins and shutouts while ranking in the top five in the NHL in shutouts (t-2nd), goals-against average (3rd) and save percentage (5th). The 28-year-old Regina, Sask., native has started all 20 games since his arrival in Minnesota Jan. 14, posting a 15-3-1 record with a 1.64 goals-against average, .937 save percentage and five shutouts in that span. Price went 9-1-1 with a 1.34 goals-against average, .949 save percentage and two shutouts in 11 appearances to backstop the Canadiens (41-16-5, 87 points) to a 9-3-2 February and first place in the Eastern Conference. He yielded two or fewer goals in each of his last 10 starts of the month, highlighted by shutout wins over the Detroit Red Wings Feb. 16 (25 SV) and Toronto Maple Leafs Feb. 28 (30 SV). Price also extended his franchise-record road winning streak to 10 games, becoming the first goaltender to achieve that feat for any team since Evgeni Nabokov in 2009-10 (11-0-0 w/ SJS). The 27-year-old Anahim Lake, B.C., native has appeared in 50 games this season, leading the NHL in wins (36), goals-against average (1.88) and save percentage (.936) while sharing second in shutouts (6). Price’s 36 victories are two shy of his career high, established in 72 games in 2010-11. Ovechkin led the NHL in goals (10), points (t-17), power-play goals (5) and shots on goal (68) to power the Capitals (33-20-10, 76 points) to an 8-6-0 February and the first Wild Card spot in the Eastern Conference. He registered points in 10 of his 14 appearances during the month, finding the back of the net in eight of those contests. Ovechkin recorded four multi-point performances, highlighted by 2-1—3 against the St. Louis Blues Feb. 1 and 2-2—4 at the Anaheim Ducks Feb. 15. He also notched a pair of game-winning goals – in a 2-1 victory over the Ottawa Senators Feb. 5 and in a 5-1 triumph over the Winnipeg Jets Feb. 19. The 29-year-old Moscow, Russia, native paces the NHL with 39 goals, 18 power-play goals, eight game-winning goals (tied) and 306 shots on goal in 63 outings this season. He also shares fifth in the League with 62 points, including 23-11—34 in his past 28 games.